Nothing says Spring like pretty pastels and tulips! This stylized wedding shoot is chalk full of both and takes place at the gorgeous, iconic hotel, the Fairmont Palliser, in downtown Calgary. After a recent cold snap and a long, snowy winter, Spring is a welcome sight of pastel hues, warmer weather and a renewed outlook. I teamed up with Tara Whittaker (Tara Whittaker Photography) and Sara Mayerson (Sarah Mayerson Design) to design this ‘Spring at the Palliser’ inspiration for you! For our inspiration we wanted a vintage yet contemporary design featuring loose, organic florals with lots of greenery. We used lots of vintage elements such a crystal and gold rimmed glasses, vintage silverware and beautiful vintage Lamoge china juxtaposed against modern geometric elements like our maple wood place card holders. Sarah designed gorgeous floral wreaths to hang over the tables and the organic centerpieces of white, green and barely there pink were placed in vintage crystal bowls. In keeping with the natural feel, we used ‘Vintage Linen’, a variety of pastel hued linen napkins and our menus and place cards, were engraved pieces of a delicate, white wood veneer. Wood veneer menus. | Photo by Tara Whittaker Photography. We engraved the wood menus on an angle for a contemporary look (and added a bit of sparkle!). We used a mix of chairs for a more interesting and contemporary look. For a current look, we used a light, maple wood for our cut out table numbers. Our beautiful couple, Clare and Marc. Clare looked stunning in this beautiful gown from Ette, and Marc in his tux from Cameo & Cufflinks. I adore this shot of the ‘bride’ with her beautiful bouquet created by Sarah Mayerson Design. We made this little bouquet charm for our bride’s bouquet. The groom’s boutonniere is both classic and contemporary. One of my favorite floral elements was this stunning wreath created by Sarah Mayerson and we made a wood banner to personalize for the couple. 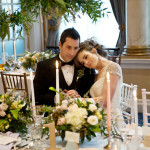 We have lots more fresh Spring inspiration to share with you, so please stop by for Part 2 of Spring at the Palliser! For more information on our planning and design services contact hello@naturallychic.ca. Special thanks to our bride and groom, Clare & Marc. To Don from Naturally Chic and Tara’s Dad for their help on the shoot!! I’m not big into trends. I prefer a couple’s wedding be tailored to their individual preferences and not based on random trends. However, weddings much like fashion and home decor, are influenced by the world around us. That’s not necessarily a bad thing! One of my favorite wedding trends of the last few years has been the trend for personalization! You can have a classic, elegant style and still have a personalized wedding! As a wedding professional, I love looking back at wedding trends of the past to see how weddings have changed and how past trends influence future weddings. Last year I wrote a post on 2011 Wedding Trends and it’s been fun reflecting on how several of the weddings I worked on this past season have included many of the trends I wrote about (many of the 2011 trends are still popular). Once again, I’ve decided to compile a list of “trends” we can expect to see in 2012. As with any trend, it’s important to incorporate trends into your wedding because it’s something you really love and not because it’s fashionable. Small inclusions of trends can give a wedding a modern edge without dating it. Choose design elements for your wedding that are a reflection of you as a couple, but go ahead and have some fun too! Kate’s wedding dress, was an Alexander McQueen dress designed by Sarah Burton with lace sleeves. Her dress may be responsible for a resurgence in the use of lace in not only wedding attire, but also in decor. Expect to see more of her “illusion neckline” that has been showing up on runways as well! The use of lace in wedding decor is also becoming increasingly fashionable! We made these engraved “faux” lace on wood veneer placecards for one of our recent weddings. The sparkle of sequins are inspiring more and more wedding decor! Here is our use of sequins in a Winter Photo Shoot we designed that was featured on Style Me Pretty! The Royal Wedding was one of classic elegance, tradition and style; as a result many couples are now choosing a more classic and formal style for their own weddings. Vintage weddings have dominated the wedding scene for a few years now and many experts believe that couples are tired of this trend. The Huffington Post’s HuffWeddings blog reported that vintage, shabby chic style weddings will give way to a more formal wedding style. They predict there will be a return to a more formal weddings influenced by classic American designers such as Ralph Lauren (whom I absolutely love by the way!). When I think of Ralph Lauren, I envision rustic elegance and luxurious natural elements; wood, leather, silver trays and candle sticks, natural shed antlers… equestrian influences. I would love to design a Ralph Lauren inspired wedding! Personally, I’m not convinced that we’ve seen the end of vintage weddings just quite yet (maybe the over the top eclectic vintage look however). I think we’ll see weddings with more of a modern, vintage vibe…elegant, rustic with small vintage touches. Here’s a recent wedding we designed that had a rustic vintage, yet elegant feel (it also incorporated lace and burlap)! What do you think? Personalization in my view isn’t a trend; I really hope it is here to stay! I love when couples have personalized, custom touches that are meaningful to the couple! Whether it’s a favor monogrammed with the couple’s name, like our engraved veneer wood smore covers or a mason jar full of popcorn (our couple’s favorite snack food), custom favors will continue to be used to add special personal touches to weddings in 2012. We personally are loving the latest wedding trends! Will you be incorporating any of these trends into your wedding? Contact us about your 2012 wedding at 1.888.679.9056 or info@naturallychic or via the Naturally Chic website.